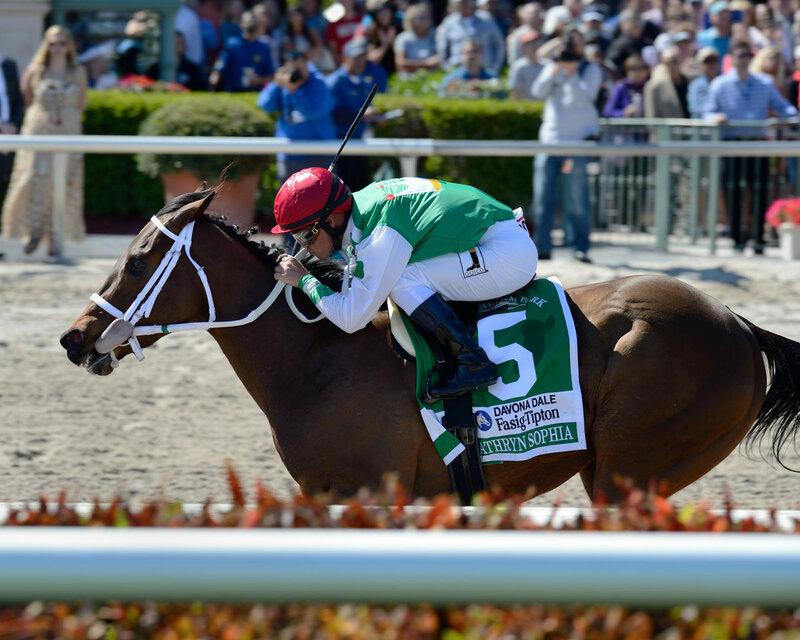 Undefeated Cathryn Sophia Scores Davona Dale Victory: An appreciative crowd applauded enthusiastically as undefeated Cathryn Sophia returned to the Gulfstream Park winner’s circle following her seven-length triumph in Saturday’s $200,000 Davona Dale Stakes (G2). 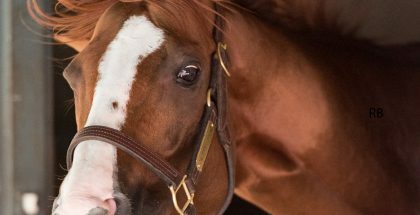 In just four career starts, which she has won by a combined 41 ½ lengths, Cash is King LLC’s 3-year-old filly has already developed an adoring fan base. While handily dismissing five other 3-year-old fillies in the one-mile Davona Dale, the 1-5 favorite showed herself to be filly with rare talent, as well as star quality. In establishing herself as a prime candidate for the $200,000 Gulfstream Park Oaks (G2; April 2) and the Kentucky Oaks (G1; May 6), Cathryn Sophia once again proved to be in a class by herself. Following up a maiden score by 12 ¾ lengths at Parx, a Gin Talking Stakes win by 16 ¼ lengths at Laurel and a Forward Gal (G2) romp by 5 ¼ lengths at Gulfstream, the daughter of Street Boss broke alertly from the starting gate to assume a stalking position between horses along the backstretch, as Dearest and R Girls a Charmer went on to vie for pacesetting honors. Jockey Javier Castellano opted to ease Cathryn Sophia back behind the leaders, who were aggressively (and briefly) challenged along the rail by 107-1 longshot Bagema. Cathryn Sophia launched a three-wide bid around the far turn under a motionless Castellano and proceeded to take the lead leaving the turn into the homestretch, never to be threatened while drawing away to victory under a hand ride. Cathryn Sophia ran the one-turn mile in 1:36.6. Lewis Bay, who loomed boldly under Irad Ortiz Jr. leaving the turn into the homestretch before the winner pulled away, finished second, three-quarters of a length ahead of Dearest. While winning her third straight stakes victory and second straight Grade 2 event, Cathryn Sophia earned $122,760 to increase her bankroll to $335,520. While easily stretching out to a mile Saturday, Cathryn Sophia has instilled confidence in her connections that she will successfully negotiate two-turns. Cash is King LLC’s Chuck Zacney shared his trainer’s feelings. An appreciative crowd applauded enthusiastically as undefeated Cathryn Sophia returned to the Gulfstream Park winner’s circle following her seven-length triumph in Saturday’s $200,000 Davona Dale Stakes (G2). Can Mohaymen Stay Undefeated in Fountain of Youth?